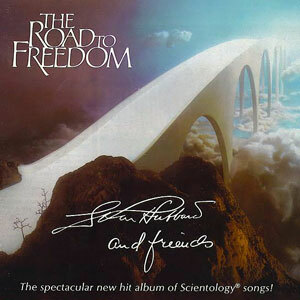 Music for Maniacs: L. Ron Hubbard & Friends "The Road To Freedom"
We interrupt our usual assortment of good music for this...this...well, it's a Scientology album, whaddya expect? Following up on our "Joy of Creating" post: clunky amateurish lyrics, horribly dated '80s wimp-pop that makes Toto sound like the Ramones, vocals by b-list actors, brothers of celebrities, washed-up child stars, never-made-its, a children's chorus, and John Travolta...yep, it's another musical pep rally/indoctrination tool from America's wackiest cult, with a truly jaw-dropping vocal from El Ron himself. If you've never heard one of these Scientology albums, you should check one out, at least once (in fact, once is probably all you'll be able to take!) to really experience how far over the edge seemingly sensible people can go. As Travolta sings: "Reality is me, reality is you, yeah yeah yeah..."
All songs written by L. Ron Hubbard. Much thanks to ma main Thetan Rich, from KillUglyRadio! Thx for this fine album. One can certainly take a critical view on Scientology, but it's a shame the uploader here seems to let the prejudice stuff the ears. This is high class 80s AOR/funk/jazzrock. And an impressive list of performers with the likes of Chick Corea, John Novello (Niacin), Eric Marienthal, Nicky Hopkins, Gayle Moran (Mahavishnu Orchestra). There is no 'imitation of funk' but razor sharp horns. And Julia Migenes - high profillic mezzo-soprano - completely nails Corea's intricate melody. Most of the lyrics may be embarasing and banal, but the musicianship is definitely beyond approach. PS, no I have no connection with Scientology whatsover. It's not prejudice - I like some religious music just fine, and I don't believe in any kind of religion. The musicianship here is technically flawless, but that's why I hate it, it's like a soulless machine - rock that's too polite to actually rock, jazz that doesn't swing, sexless funk.. But, hey, glad you like it! See, we all get something out of it. You are a con-a-sewer of the arts and bow to your greatness in the most profound manner possible. You are a national treasure. Such taste, such refinement. I am in awe. Ha! Thanks windy, I do consider myself a kinda-sewer of the arts.